Tower Safety and Rescue courses and OUR STAND!!! According to the Bureau of Justice Statistics the total incarceration rate in 2011 - 2012 for veterans was 855 per 100,000 veterans in the United States. About 1 in 37 adults (or 2.7% of adults in the United States) was under some form of correctional supervision at year-end 2015. Telecom Technical School Director, Kathy Gill, goes into various prisons around the state of Arizona to work with the incarcerated population and provide them with training and a job opportunity. Telecom Technical College is committed to the community to help better individual lives with education and an opportunity for a career in the wireless industry, and we’re proud to share a couple success stories that came from this commitment. We recently offered a student a scholarship from a job fair we attended at the Department of Corrections. His dedication of riding his bicycle 20 miles to school every day to receive training inspired Telecom Technical College to start contacting potential employers to assist with his job placement and two days after finishing school, he was successfully working in the wireless industry! Another success is a man named “Jesse”, who spent 5 years in federal prison. At the time, he was in a prominent gang selling drugs. During his incarceration, he would tell himself “I am never going back, I will find a way”. His wife was left to raise their 4 kids alone, providing food, shelter and parental guidance as she waited for her husband to be released. Jesse had several opportunities and choices- selling drugs or become a role model for his family. He chose family. Jesse is well respected by many and if he says he is going to do something, he will stand by his word. His word was to take care of his family and today he owns a successful wireless cell tower construction company and takes care of 30 employees and their families. His success story is an inspiration to all of us who believe in hard work and second chances. Telecom Technical College is now open, and is offering a Telecommunications Tower Technician certification of completion for individuals interested in expanding their education and skills in the telecommunications field. We are a safety training school for the student wanting to start a career in the wireless industry.Who is Telecom Technical College?Telecom Technical College, also referred to as TelTech College, is committed to providing a safe and healthy learning environment for their students. Our dedicated instructors devote our complete attention to the safety and success of our students. We stand for workplace training by providing education that empowers individuals. What licensures and accreditations does TelTech College have? TelTech College is Arizona State Board for Private Postsecondary Education recognized. In addition to being licensed by the Arizona Bureau for Private Postsecondary Education, we are affiliated with the AZ Private School Association, EPTL, Workforce Arizona, MTCAZ, Department of Labor TIRAP and the American Red Cross. How is TelTech College different than other training programs? TelTech College is one of the few schools in the country to offer this program. Our Chief Training Office Michael Halstead has over 20+ years in safety, telcom construction and OSHA compliance, and School Director Kathy Gill has over 25 years of industry experience. You’ll be hard-pressed to find other resources with such impressive expertise! Why is training important in the wireless communication industry? The wireless communication industry continues to boom and with that growth comes the demand for trained individuals in tower safety. Prior to the 1980s, communication and broadcast tower erection, servicing and maintenance was a very small and highly specialized industry, and known to few outside the industry. 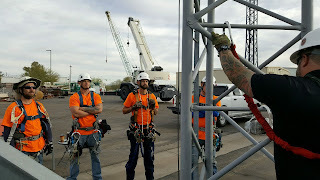 Over the past 30+ years, the growing demand for wireless and broadcast communications has prompted an increase in communication tower construction and maintenance, but the personnel to effectively fill these jobs sometimes lacked in training and expertise, not only in the skill to execute the climbs, but understanding and following OSHA regulations, standard safety procedures, radio frequency knowledge, and overall competent climber skills. The importance of tower climber safety can’t be overstated as it continues to be an unrelenting concern for wireless and other companies across the country. Now more than ever, companies that employ tower climbers are feeling the impact of a decrease in safety compliance on the job and a lack of trained workers to execute the job safely. To increase climber safety compliance, companies need to provide climbers with the right training and equipment and make teamwork the backbone of all safety initiatives. TelTech College can provide that training! TelTech College is thrilled to offer our certification of completion to prepare students for a career in the wireless industry. Contact us today for our full catalog and to speak with us about attending our program. · The 2014 total of 4,821 fatal work injuries was 5 percent higher than the count of 4,585 fatal work injuries reported for 2013. The count for 2014 was the highest since 2008. · 4,821 workers were killed on the job in 2014 [www.bls.gov/iif/cfoi_revised14.htm] (3.4 per 100,000 full-time equivalent workers) — on average, more than 92 a week or more than 13 deaths every day. · 804 Hispanic or Latino workers were killed from work-related injuries in 2014—on average, more than 15 deaths a week or two Latino workers killed every single day of the year, all year long. · Fatal work injuries involving contractors accounted for 17 percent of all fatal work injuries in 2014. If we are still having deaths and fatalities in the construction industry, then we need to work on the behavior. I listen to TED talks quite frequently and I remember one about a war correspondent. She reported on some of the worst conditions any human should never be subjected to. In one particular story, the town was told to evacuate as war was coming, yet no one wanted to believe it. They created Willful Blindness, it won’t happen to me. Ignorance in any situation is the unwillingness to recognize hazards and dangers of a situation and the risks involved. 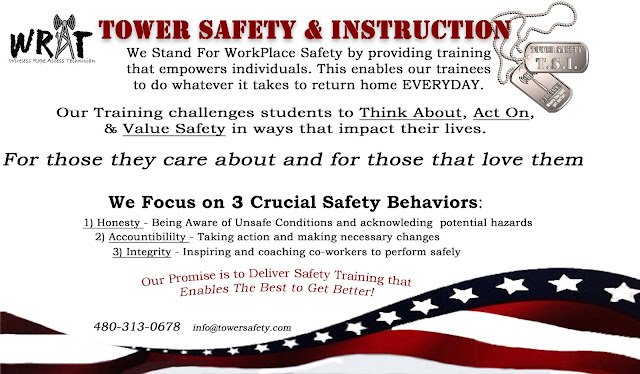 We all have the courage within ourselves to make a difference with our safety and protecting our team members; don’t fall prey to Willful Blindness!